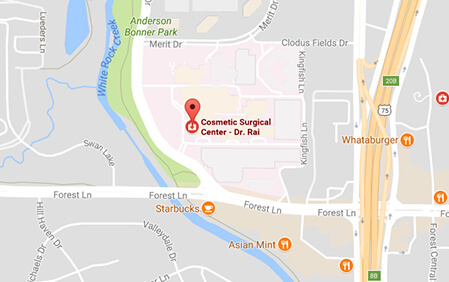 We recommend silicone implants for most of our Dallas patients because they produce the most natural look and feel. Silicone implants are made from a cohesive inner silicone gel that is surrounded by a thick outer silicone shell. Silicone gel implants are approved by the FDA in women under 22 only in some very special conditions like congenital breast deformities and breast reconstruction. Silicone gel implants have a silicone polymer outer shell which is filled with silicone gel. It is important to understand that the backbone of silicone is a chemical called polydimethylsiloxane (PDMS). PDMS’s basic structure is chemically modified by changing the length of the polymer chains and extent of cross-linking to yield a liquid, a gel, or a shell. Thus, silicone gel implants are silicone shells filled with silicone gel. The shell structure is further modified to reduce silicone bleed outside the implant. Present implants are memory gel implants by Mentor, gummy bear implants by Natrelle’s Inspira line and Sientra OPUS. The terms: Memory gel, gummy bear gel and opus all signify gel characteristics of implants manufactured by three manufacturers (Mentor, Natrelle and Sientra) in USA. Essentially, they are all filled with new generation gels that stick together, resist flowing out of shells and maintain their shape. Silicone gel filled implants feel more breast like, have less ripples and can be placed in front of the chest muscles. Presently, silicone gel implants are only approved by the FDA for women 22 years of age and older. Since being approved by the FDA in 2006 for use in cosmetic surgeries, silicone implants have helped millions of women feel more comfortable and confident in their bodies. To learn more about how silicone implants can enhance your figure, call (972) 392-3511 today to schedule your consultation with experienced Dallas breast surgeons Dr. Vasdev Rai, and Dr Surjit Rai.